Knowing the outcome doesn’t always make a choice easier . . . Addison Coleman’s life is one big “What if?” As a Searcher, whenever Addie is faced with a choice, she can look into the future and see both outcomes. It’s the ultimate insurance plan against disaster. Or so she thought. When Addie’s parents ambush her with the news of their divorce, she has to pick who she wants to live with—her father, who is leaving the paranormal compound to live among the “Norms,” or her mother, who is staying in the life Addie has always known. Addie loves her life just as it is, so her answer should be easy. One Search six weeks into the future proves it’s not. In one potential future, Addie is adjusting to life outside the Compound as the new girl in a Norm high school where she meets Trevor, a cute, sensitive artist who understands her. In the other path, Addie is being pursued by the hottest guy in school—but she never wanted to be a quarterback’s girlfriend. When Addie’s father is asked to consult on a murder in the Compound, she’s unwittingly drawn into a dangerous game that threatens everything she holds dear. With love and loss in both lives, it all comes down to which reality she’s willing to live through . . . and who she can’t live without. Who hasn't wondered what their life would be like if they chose a different path. Addison is able to see all of her seperate paths before they happen. When Addison has to make a very major life choice and either stay in the Compound with others who have abilities or to become a "Norm" and move to the outside- she searches into her future. I have to say, it was incredibly ... interesting to read about Kasie's two possible futures. I say interesting in a good way, because both futures had positives and negatives- so no matter what Addie picked, her life would have major ups and downs. To be honest, I didn't read the blurb above before reading the book and I am a little glad. *spoiler alert* Someone Addie cares about dies in both of her futures. The story ultimately becomes- will I follow what I want, or go the hard route to save the person I love? At the end, Addie actually didn't make the decision that I thought she would- it surprised me actually. The reasoning that the author gave was sound, but I was still surprised. I did get a little confused, switching back and forth so much, because I had to keep putting the book down. I loved Addie's voice in this book. I felt like I was reading about a friend- there was no self righteousness about her or any fakeness. Addie felt as real as any of my friends. 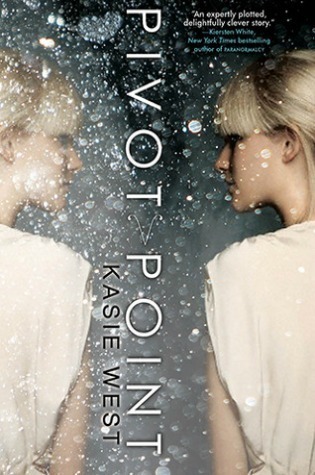 Pivot Point was a young adult book unlike anything else out there. If you have ever wondered if you made the right choice on your path of life... this book is not one to miss.